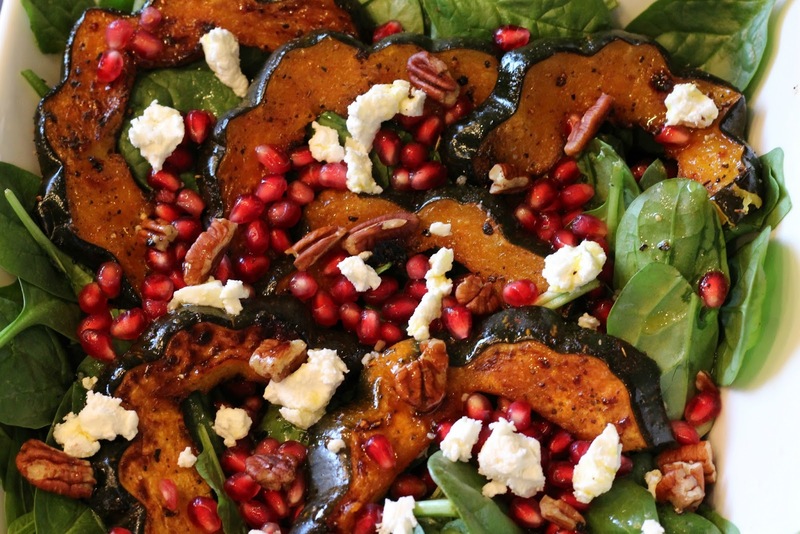 This salad is one of my favorites for fall. I have been adding it to my weekly lunch menu with the addition of a little roasted chicken and it is divine. It is also beautiful, which makes this mama feel fancy when it's noon and I'm still in my PJs. I hope you enjoy! 1. Preheat oven to 425 degrees and line a baking sheet with parchment paper and a light spray of EVOO. 2. 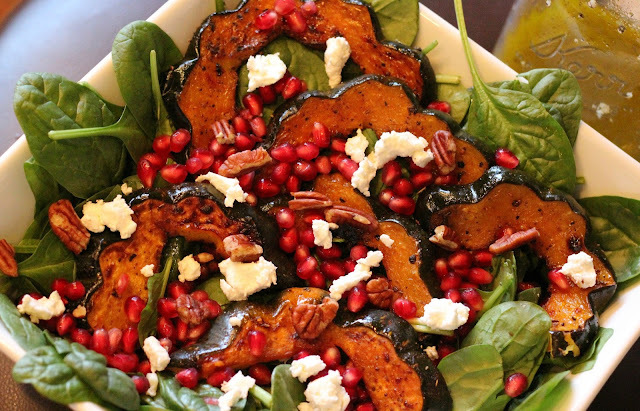 Add acorn squash to baking sheet and drizzle with EVOO then sprinkle with salt, pepper, garlic powder, smoked paprika and rubbing sage. Rub in, then repeat on opposite side. Finally, drizzle with maple syrup. 3. Bake at 425 degrees for 20 minutes, then flip squash and bake for another 15-20, or until golden brown and fork tender. 4. While squash is baking, mix all the dressing ingredients in mason jar and set aside. 5. 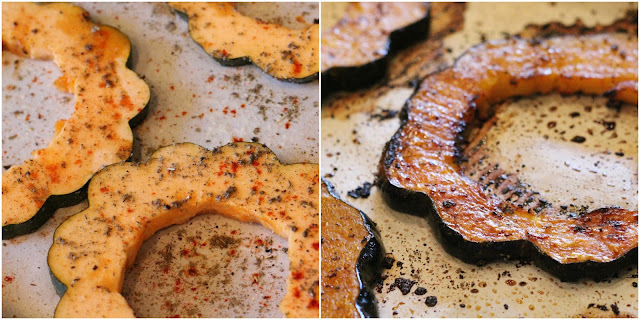 Once squash is done, remove from oven and cut in half. Finally, plate spinach and top with squash, pomegranate seeds, roasted pecans, goat cheese and dressing. Note: If you need a little extra protein, add roasted chicken as well! Linking up with these great ladies today: Full Plate Thursday, Home Matters Linky Party, Showcase Your Talent Thursday, The Creative Exchange, The Inspiration Gallery, Artsy Fartsy, Thursday Favorite Things, Handmade Hangout, Weekend Blog Hop, Create It Thursday, Fabulous Foodie Fridays, Foodie Friday and Everything Else, Foodie Friends Friday, FoodieFriDIY, Freedom Fridays, Friday Favorites, I’m Lovin’ It, Weekend Potluck, Our Mini Linky Party, Link Party Palooza, Pretty Pintastic Party and Allergy-free Thursdays.